No one is perfect. Some of us achieve moments of near-perfection, yet none of us are able to attain and maintain true perfection in this life. We are all the same to God, imperfect but love-able. When we observe another’s imperfections and judge them, we are being unfair. How can we expect from another what we cannot achieve ourselves? Some of our imperfections can be seen on the outside, yet most are unseen to the eye. Many of our imperfections are hidden. This is where we struggle the most… with greed, arrogance, hate, jealousy, fear, and other sins of the heart. We must not gloat about our strengths or take pride when we are right! Instead, we should be humbled by our areas of needed growth. 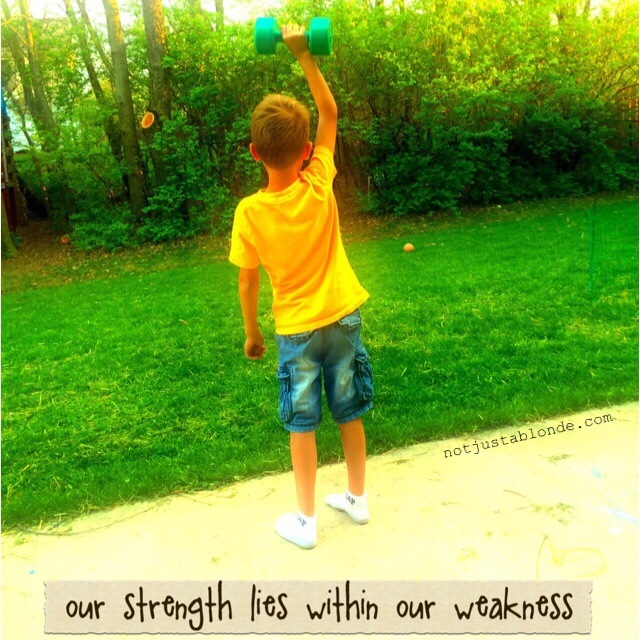 Our strengths may indeed be another’s weakness… however our weakness is also the strength of another. Our strength lies within our weakness and our weakness within our strength..
God has used me most effectively when I allow myself to be vulnerable and admit my weaknesses. When I am open and honest about where I’m at I can authentically connect with others. The masks come off and true relationships can begin! This is where the strength of love can best enter into our hearts and into each other’s lives. God loves each of us no matter what. He knows each of our weaknesses and understands our limitations! He does not ask that we be perfect but that we submit our weaknesses to Him and let Him use us where we are needed! He needs us to love. The miracle of life is that God can bring more love to this place through our imperfections and weaknesses than through our power and strengths. I believe God gets great joy out of this earthly irony! God’s power is made perfect in weakness. God doesn’t require perfection but requests humility, acceptance and a desire to love one another. It is through our weakness that God can assert his strength and bring us closer to Him and His Love… and bring His Love to a hurting world that needs it! 2 Corinthians 12:9 (NIV) ~ But he said to me, “my grace is sufficient for you, for my power is made perfect in weakness.” Therefore I will boast all the more gladly about my weaknesses, so that Christ’s power may rest on me. Ann, you’ve hit the nail right on the head, as you often do. When I look back on my life, some of the things that I did, particularly in my late teens and early 20s, now make me cringe, and feel guilty for what I did. However, God has shown me how He used some of those things to bring something good out of them. I must have known that I should not do them, but he nevertheless used them to reduce the overall suffering that the people involved were undergoing. He brought good out of bad things. Ahh… humility. Being grounded in our humanity, Thanks for this today. When we are able to acknowledge our weakness and deal with them, it is much more difficult to judge others for their weaknesses. It’s that ‘2×4 in the eye’ thing come to life. Love and compassion are better than judging others. Although none of us is perfect, we can and should strive toward perfection in love, because it is true that perfect love drives out fear. If we have perfect faith in God then we will be able to overcome any fear that remains in us and do whatever He wants us to do. Doing everything that He wants us to do is the way that we show God our love for Him. OK Ann, I have recognized for some time that there is ‘perfectly adequate.’ I also recognize that it is only God who can bring us towards perfection, if He is willing. We cannot do it by ourselves. At last the revelation! You are afraid of reverting to being a perfectionist. Why? You need to trust in God to help you not to do that. He has not rescued you from it to let you to slip back into its tyranny. He didn’t allow: ‘be perfect as God is perfect’ into the Bible for nothing. Reach out and claim it. He is willing. I don’t believe that was Jesus’ intended meaning, yet I do believe that the verse holds value. I stand by my belief that perfectionism is a false idol and that humility, compassion and love are more worthy of our efforts. The words given to you on May 6 were not my own; however, my duty in giving them has now been fulfilled. What you choose to do with them is your responsibility.